Welcome to week 5 of Lent. This week we are looking at how Jesus comes to terms with the inevitability of his death in John 12:20-33. 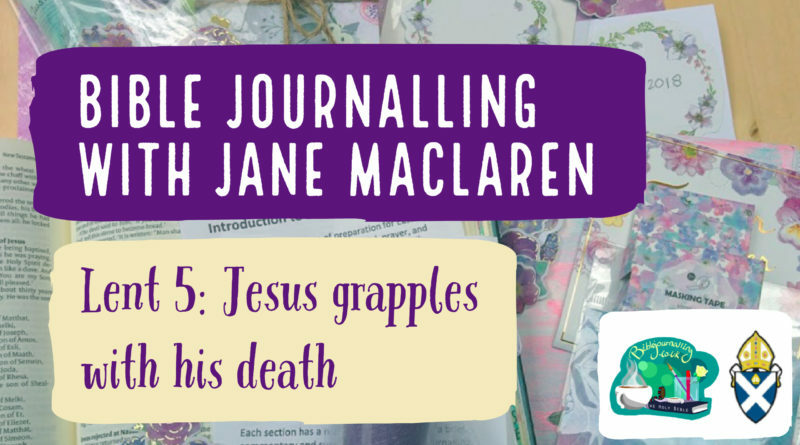 We’re working with Jane MacLaren to bring you an online Lent group, looking at the traditional Gospels through the format of Bible journalling. Jane is a non-stipendiary priest with a passion for helping people explore their relationship with God through this technique. Follow along here, sign up for emails about the course and join our Facebook group to connect with others on the course from across the diocese. If you want a little more background on this course, along with a link to previous posts in the series, read the intro post here. This week’s Gospel Reading is John 12:20-33. Reading this passage again and listening to the sermon in Church this-morning made me realise just how much Jesus had to grapple with his inevitable death: “My soul is troubled, and what shall I say?” (v27). That’s just how I feel when facing the death of people I love. What is there to say? It’s troubling to the soul when what seems like a tragedy actually happens and there are no easy answers. Jesus knows he is going to have to die. As our Rector said this morning, it takes great courage to be terribly afraid about something but to go through with it anyway, trusting God to the best of your ability, and you see Jesus here feeling troubled and afraid yet resolute. Maybe one of these stands out for you, or maybe something else. Take a phrase or word that speaks to you today or attracts your attention. Write it in the middle of your page. 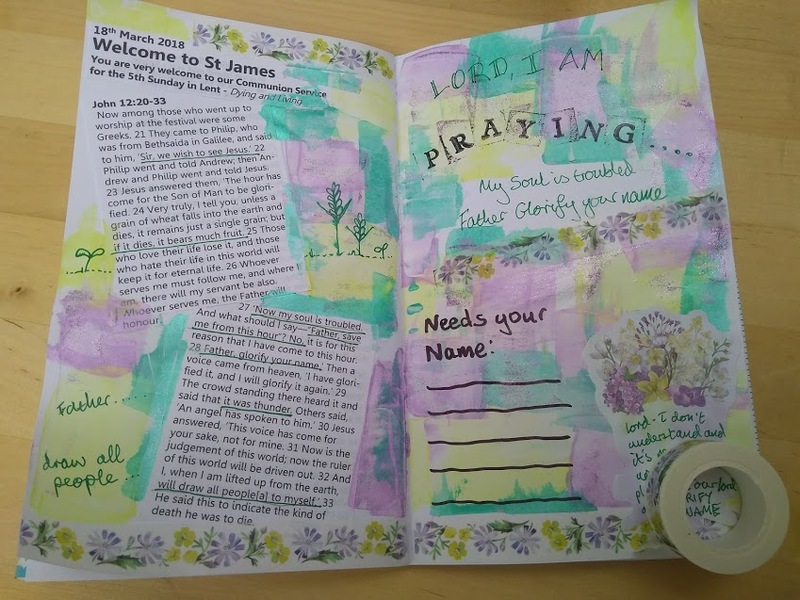 Decorate round it, annotate it, colour it, illustrate it, pray into it and listen. What is God saying to you? This week I’ll be visiting the hospice. I’ll be depending on God to ‘glorify his name’ in what feels like some very soul-troubling situations. How will God’s word sustain you? Get the printer-friendly version of the Reflection notes here. 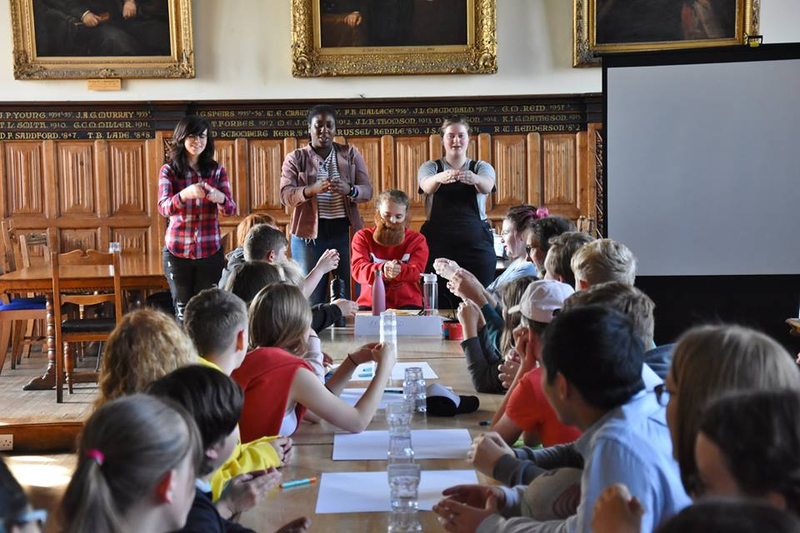 It’s easy to get hold of a tube or bottle of acrylic paint – craft shops and toy shops alike tend to stock it and it’s not expensive if you get the childrens’ grade. You can create a very vibrant or soft background very quickly. Squeeze a bit of paint onto an old credit card or gift card (or a cut-up piece of one if you want to make a smaller mark). Scrape the paint across the page in a block of colour. Choose a different colour and do the same again. Build up your colours till you have a background pattern that you are happy with. If it all gets too bright or muddy you can get interesting effects by scraping some white over the top to tone it all down. Because you are scraping the paint very thinly it dries quickly. You are then ready to write over it. Any gel pen or ink pen will do – biros can struggle if there is some texture to the paint. You can also stick things over it such as pictures cut from magazines, stickers or washi tape. Editor’s Note: Jane’s made an excellent video for this technique. Pop along to her YouTube channel to see it.